WBC BREW BAR 2010 - Marco Beverage Systems Ltd. I am pretty excited about the Brew Bar at this year’s WBC, to be held at Caffe Culture in London, between 23 & 25th June. I have been working with the WBC on the design and layout of the Brew Bar and how it will operate this year, learning from feedback after last year’s version in Atlanta. 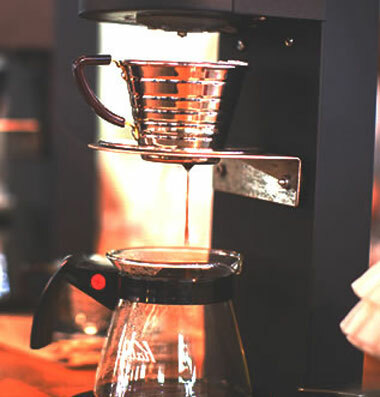 The idea is create a place for baristas and show-attendees to enjoy some great coffees through a variety of hand-brewing methods. The WBC Brew Bar by Marco is going to be a play area for fine baristas to choose between any of the following brew methods: Hario Siphon; Aeropress; Chemex; Bodum French Press; Siphon and Tru Bru pourover. The nice part is the coffes are being supplied by a who’s who of Speciality Roasters from around the globe. Coffees from Square Mile & Hasbean (England); Coffee Angel (Ireland); Tim Wendleboe (Norway); Da Matteo (Sweden); Intelligentsia & Counter Culture (USA) will all feature. The embodiment of brewmethods.com! Dunno about you but I think that is pretty special. Water will of course be courtesy of 2 Marco Über Boilers and a couple of customized Ecoboilers, hopefully including one featuring the excellent Grower’s Cup concept from Denmark. Grinding via the Über Grinder. WBC will announce shortly how baristas can volunteer to work shifts at the brew bar, play with the Über and brew some pretty fine coffees. I’ll also have a Digital Refractometer and Extract Mojo from Terroir on hand to measure brews. This year, as last, there will also be the WBC Espresso Bar which will comprise 3 Espresso Stations for espresso, capps and lattes, etc. It looks like sig drinks will be axed from the Espresso bar this year. If only the WBC rules were to follow suit and replace the sig drink with a brewed coffee :). The Espresso bar is sponsored by Daterra, but I do not know who the roasters are.